The Scotland Yard offers our Scottish Clan Crest Pewter Badge in over 200 clans. Our Scottish Clan Crest badges are imported directly from Gaelic Themes in Scotland. 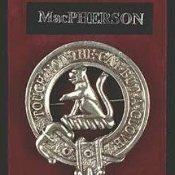 The Gaelic Themes Clan Crest kilt pins and Clan Crest cap Badges are more durable and are available in more Scottish Clan Names than the Clan Crest pins and Badges from Art Pewter. Please select the Clan you wish from the list below. Size is 2 inches in diameter.